Cathy Judd-Stein is the new chairwoman of the Massachusetts Gaming Commission. Governor Charlie Baker's pick to lead the Gaming Commission, Cathy Judd-Stein, chairs her first meeting on Thursday. Gambling regulators need to deal with uncertainty over the eastern Massachusetts resort casino, slated to open in just a few months. The Commission also at some point will need to decide whether to award a casino license in southeastern Massachusetts, plus staying on top of other casinos that are already open, like MGM in Springfield. For our quick look at the week ahead in politics and government in Massachusetts, Matt Murphy of the State House News Service joins us. Sam Hudzik, NEPR: So what tops the priority list for the Gaming Commission? Matt Murphy, State House News Service: I think all of the above. [Judd-Stein] has certainly got her plate full. They had a brief agenda-setting meeting last week, but this is her first real meeting at the head of the table of the commission. Those things hanging over their head — what to do with Wynn Resorts, slated to open in June, which is getting closer by the week — I suppose the longer this goes without a decision, the harder it gets to pull the plug, if that's the route they want to go. But we're waiting on some court proceedings in Las Vegas to help clear the path for that. The decision in southeastern Mass. — they've been kind of pushing this off for a while, but eventually, it's going to come to a head, and they're going to have to make a decision about whether or not they think the Mashpee Wampanoag tribe is likely to get their federal recognition, and be able to build that casino, or if they're going to have to open this up to a commercial bidding process. Last week, you also wrote about state Rep. Paul Brodeur heading to Washington to testify about the deal that will eventually lead to a $15 minimum wage in Massachusetts. 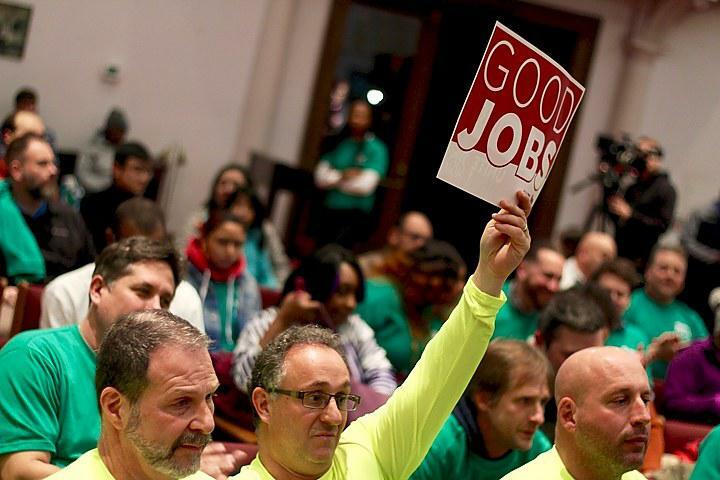 It's one thing to get that wage in Massachusetts, but did you get the sense, watching the hearing, that there's any appetite for a federal minimum wage up there? Currently, the federal minimum wage is less than half that. Yeah, the federal minimum wage is just at $7.25 now, and it's been about a decade since the last increase in the federal minimum wage. I think that was a three-phase increase that the last hike took place in 2009. So it's been a while for minimum wage workers in states that have these low minimum wages, or minimum wages tied to the federal wage. There's certainly an appetite among Democrats on Capitol Hill for a $15 minimum wage, but I'm not sure about its prospects overall, and getting through a divided Congress and getting through the president. But Paul Brodeur, last session's chair of the labor and workforce development committee here on Beacon Hill, went to testify, and he argued for the benefits it has provided in Massachusetts. But we heard from members of Congress from other states raising questions about how that would work in lower cost-of-living states. It would stand to reason that Massachusetts could benefit from a federal wage hike, because it would put Massachusetts more in lockstep with its competitor states for new businesses to locate there, and for jobs to grow. But I think it could be an uphill climb to see this type of legislation get through at the federal level right now. State legislative leaders on Beacon Hill are expected to formally announce committee assignments and leadership roles. Some of those come with pretty hefty stipends for lawmakers. Have all these been worked out behind the scenes already? Or is there going to be some last-minute lobbying for those jobs? We're crossing our fingers here, hoping that these do get announced this week — and that's what it looks like — so that the session can really get underway, and legislation can start getting assigned to these committees, and the hearing process will start. You know, a lot of these positions won't change. A lot of them will be carried over from last session. But the speaker and the Senate president both have some key decisions to make, including who chairs the powerful budget-writing Ways and Means Committees in both branches. On the House side, there's openings with the health care financing committee chairmanship, the revenue committee chairmanship, the higher [education] committee chairmanship. So there a lot of moving pieces there, because of retirements and other departures. Once you make one move, there's another move behind it. So that's what's probably taken some time, but these are decisions the speaker makes. He has private meetings with members. He talks to them about what assignments they would like to have, and then he tries to fit and slot people in, to the best of his ability, to match skills with the openings. But certainly, a lot of lobbying has been going on for some of these top jobs.